What happens to a man when he reaches mid life, loses his marriage, job and home, and decides on a whim to emigrate to a country where he can’t speak the language? 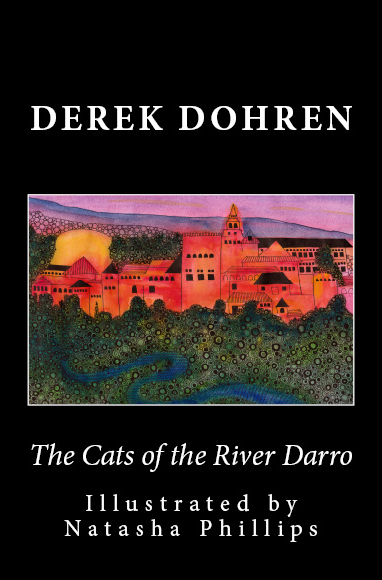 The Cats of the River Darro tells the tale of one such man’s adventures in the beautiful Spanish city of Granada. After hastily training to be an English teacher Liverpudlian Derek Dohren has nothing to lose except his dignity as he plunges head first from one classroom mishap to the next. Wonderfully illustrated by talented new artist Natasha Phillips this hilariously entertaining book is written in an intriguing mix of straight narrative and fictional short stories with the writer regularly sharing his thoughts on art, religion, quantum physics, and of course cats. Share the writer’s journey as he uses fantasy and science, God and the afterlife in a glorious attempt to make sense of a world that for him has been turned upside down. On a parallel earth somewhere in the vast multiverse we call home this book has already zipped to the top of the bestsellers lists.